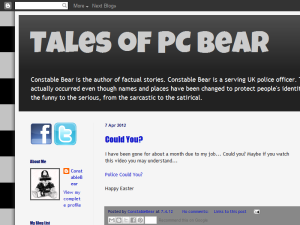 These are the tales of a UK police officer writing blogs under the pen name PC Bear. These are all stories that actually occured even though names and places have been changed to protect people's identities. These tales are meant for light reading and not to be taken offensively. This what your Tales of PC Bear Blog Ad will look like to visitors! Of course you will want to use keywords and ad targeting to get the most out of your ad campaign! So purchase an ad space today before there all gone! If you are the owner of Tales of PC Bear, or someone who enjoys this blog why not upgrade it to a Featured Listing or Permanent Listing?